Type II fun is a delayed type of fun; it’s something you hate in the moment, but love later on—and it’s something that Ben has been chasing for years. He’s spent most of his life bouncing between jagged mountain ranges around the world, trying to find that ever-elusive balance between his passion, outdoor adventures and ways to make them a sustainable reality. 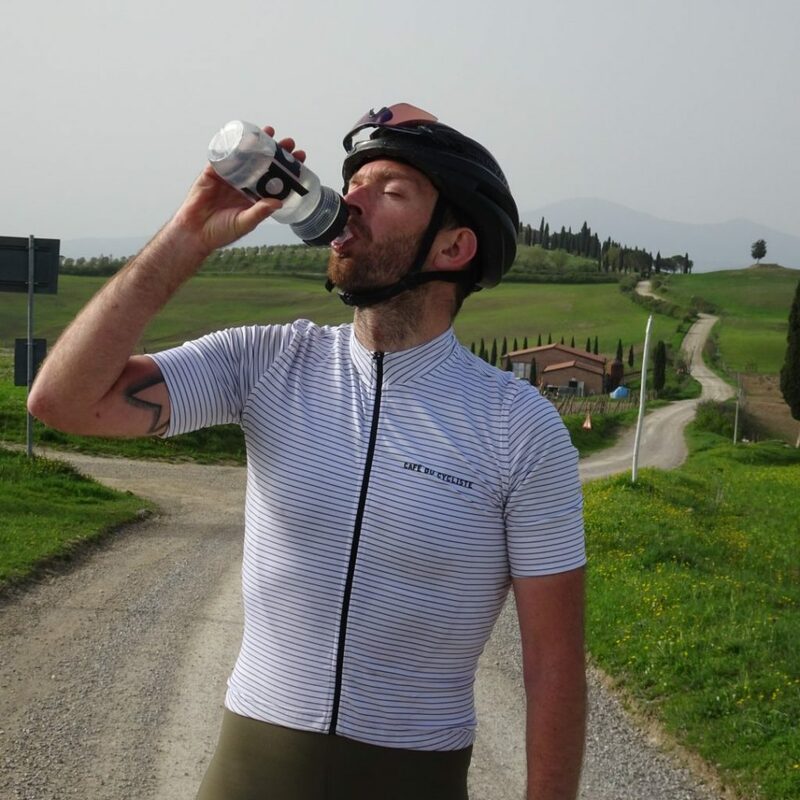 He’s raced mountain bikes at the Enduro World Series, Megavalanche and Mountain of Hell, as well as slowly transitioning into more adventure based long distance events, including gruelling ultra distance events like the Transcontinental. We caught up with Ben to find out what motivates and inspires him to take on such challenges, how he’s adapted to life in the UK—and to find out why he’s attracted to type II fun! “I’m currently based in Frome, a small, rural market town nestled in the heart of Somerset, UK. It’s unique because there’s an independent council which helps to keep the focus around what’s best for the community. There is a lot of creativity around, small businesses and inspiring people. Bath and Bristol are close by, and you have stunning countryside right on your doorstep. So much is nearby just waiting to be discovered. Quiet, undulating roads around the rural countryside, Wind Hill, a freeride mountain bike park just a few miles out of town, and miles of dirt road across the Salisbury plains. I’ve always tried to spend as much time outside as I can. From a young age, we went on family cycling holidays. We would go to the Peak or Lake Districts and sometimes over to the Alps to watch the Mountain Bike World Cups or Tour de France. I guess that really piqued my interested in bikes from a young age. As soon as I was old enough to travel alone I saved up money and would spend all summer in the mountains riding everyday and living off pasta and rice. Luckily my life has evolved since then: I still ride loads but thankfully have a slightly more balanced and varied diet. We moved to Frome for my job. I’m lucky enough to have found work in the bike industry and work with one of the world’s leading companies. I make sure that countries around the world have the right product at the right time. Most days, I chat to people about bikes or parts and encourage them to get out and use them more. So, when the work day ends or the weekend comes around, I’m ready to get out and have an adventure myself. One of the big things that draws me to cycling is the ability to explore new areas, cultures and find unknown places. I met my wife whilst living in the French alps where we both fell in love with discovering the area by bike together. 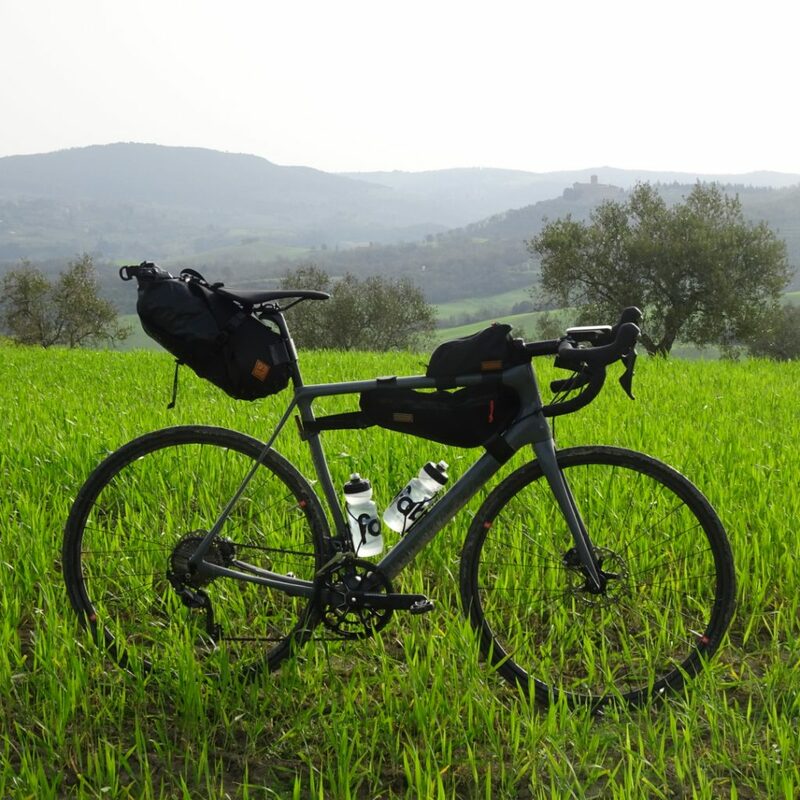 Since then, we have planned and completed some amazing bike rides including completing the Transcontinental race; a single stage 3,600 km race across Europe. We managed to finish in 12 days! 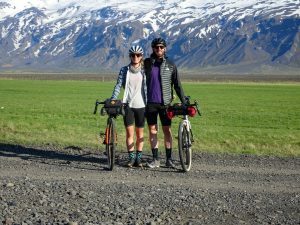 Bikepacking across the Pyrenees, taking in every Col (the Pyrenees’ famous climbs) and a very remote gravel tour in Iceland. Recently, we have been spending some time teaching our little girl to trike and how not to crash into the cat. I always think the more challenging the ride is at the time, whether that’s extreme distances, weather or remoteness, the greater the feeling of satisfaction and achievement after. My wife and I have got ourselves into some far from ideal cycling situations where not everything has quite gone to plan, but these are moments we often now remember and laugh about. They usually involve being cold, tired, hungry and a long way from home. The only thing that gets you through is a good sense of humour and the realisation that you’re in it together. 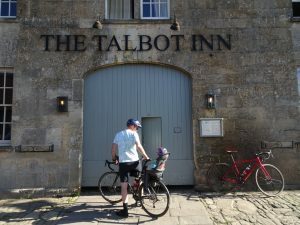 Its not all about pain and suffering and epic rides though, I do, however, also really enjoy a spin in shorts and a t-shirt to a nearby cafe or pub garden. 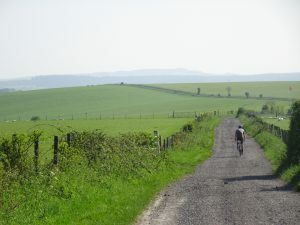 The UK offers some cool riding and a vast network of small roads. Since moving back, I’ve completed some long rides, two that have stood out for me are Windsor – Chester – Windsor. 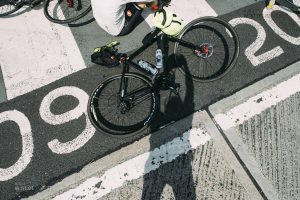 This event is set up to prepare people for completing the famous Paris – Brest – Paris Audax in France. 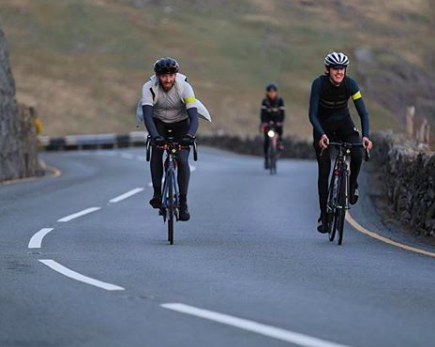 Another great ride is the Bryan Chapman, the 620 km route takes you from South Wales to North Wales and back again, through some of the most unspoilt parts of the UK. 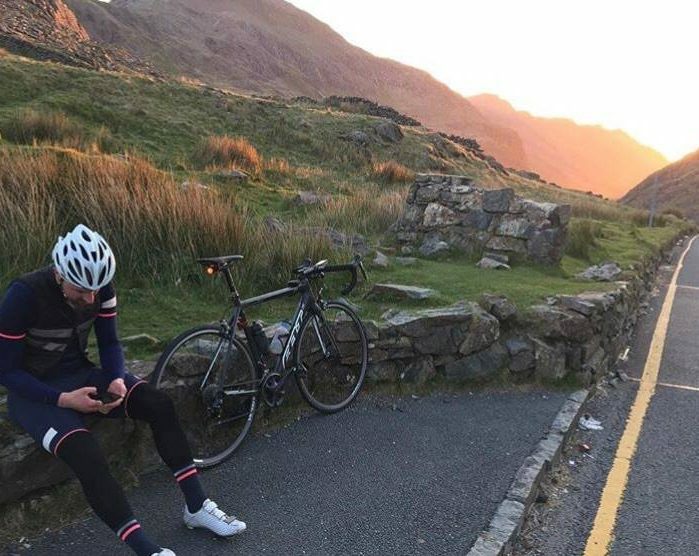 A real moment to remember was summiting the Llanberis pass with a big group of friends at sunset after 250 km of riding that day. It was amazing, to say the least! I love planning rides and filling my calendar with events. This year I’m keen to explore more places that I don’t know enough about. I want to explore more of north Scotland and the roads around Devon and Cornwall in the very south west of England; hopefully in the form of some weekend bike-packing. Event wise, last year I did the Epic Echappée which was a blast, so I’m definitely up for some more off road riding on a road bike—something like Dirty Reiver in Northumberland. We’ve also got some plans for large single day routes back on the continent this summer. I love komoot because it’s so easy to use on the fly and a great back up if you ever do end up getting slightly lost. As a family, we love to travel and I’m away a lot with work. I find it so easy to use and as a helpful tool to make sure that you make the most of your time when exploring an area you don’t know very well. My top hack for komoot users is to always check the Highlights for different disciplines—especially if you are in a new area. Sometimes a great hiking Highlight may also be worth checking out on a bike.